Most of the time, I figure by the first of December, it's probably too late to start getting crafty with Christmas gifts. 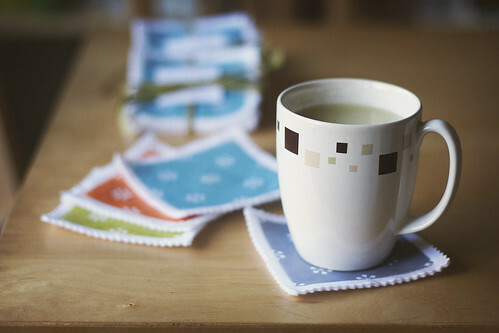 But last year, I happened to come across a tutorial for felt coasters over on Design Sponge. I read through the instructions and found that they weren't overly complicated! I was woefully behind on my knitting of gifts, but still wanted to make something crafty for some friends, so I decided to try making coasters. There's some lovely vintage postage stamp artwork included with the tutorial, and I did use that for my test batch of coasters but ultimately decided to design my own modern "snowflake" pattern on colors that would work year-round. The stamp images definitely work well with the pinked edges, but I think they looked nice as a decorative border on my non-stamp themed design. The nice thing about these is that you can get pretty assembly-line with them. Print out sheets, iron them all on fabric, cut them all out, pin them all to sheets of felt, sew, and cut! I was able to get a pretty large quantity of them done over a couple of days. And once I got things pinned to the felt, they were easy to store out of reach of the cats if I didn't feel like finishing them up the same day. They're definitely something I'd make again.